Frame made of solid wood and multi-ply wood with interwoven elastic straps. The upholstery is made of polyurethane foam, covered with dacron. The back cushions are filled with Piumafib, a special hypoallergenic mixture of feathers and siliconised polyfibre*. The seat cushions are made of a foam insert with density of 30 Kg/m3, covered with a feather compartments quilt*. 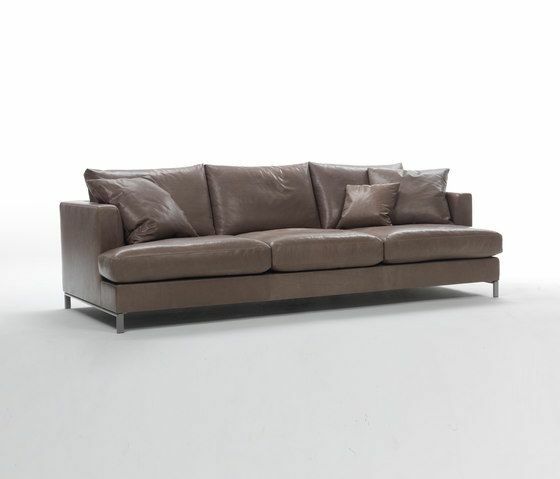 Fully removable fabric covers, fixed leather and artificial leather covers. Sofa-bed is available. Available seat depths: 100/110/120 cm *Maintenance of feather cushions: Cushions filled with feathers tend to change their shape with use. In order to keep their shape it is necessary, even after a short use, to plump up the cushions repeatedly. Never use carpet beater or vacuum cleaner. We recommend to choose foam cushions to those who do not wish to follow these instructions or to have a “used look” sofa.